President Obama’s 2011 State of the Union address stated his desire to see this country return to technological greatness. He sees future prosperity directly tied to our ability to innovate and drive new technologies and industries. To that end, college education is critical in teaching the skills professionals need in the workplace. But education in America, and “college education” in particular, is a very broad term that produces graduates with a huge range of capabilities in the workforce. Science and Engineering are the fields of study that invent technologies and create new industries. Yet education in America produces more art majors than engineering majors, way more psychology majors than engineering majors, and four times more business majors than engineering majors. More disturbing is the fact that the trend is worsening with every passing year. Interestingly enough, the Huffington Post recently featured an article detailing two different points of view on education in America from two of the most famous engineers of all time. Bill Gates supports targeted investment in science and engineering fields of study, while Steve Jobs supports a broader educational background including arts and humanities. One the one hand, all the engineering knowledge on the planet is useless without creative and relevant applications of the knowledge. On the other hand, you can’t creatively apply anything if you don’t have the difficult, tedious, unglamorous technical knowledge. Many students are turned off by engineering for this very reason, it isn’t fun. A large part of education in America is about having fun. Ideally we could create a program that combines both Gates and Jobs’ points of view. Focus engineering education in America on hard technical knowledge, but ground it in real world creative applications. Before any of that matters however, students need to actually enter the engineering field of study. An overwhelming majority of students choose liberal arts and business fields. There is certainly an important and necessary place for these sorts of majors in our society, but when you’ve got 8.5 liberal arts majors for every 1 engineering major, something is wrong. The economy has shifted from invention, development, and production, to services and management. Invention, development, and production (i.e. innovation) is occurring in other parts of the world now, and is no longer being led by America. In fact, looking at the percentage of degrees by field of study across the world, education in America is clearly trailing in engineering, math, and science. 30% of German students graduate with a science or engineering degree, 28% of French, 25% of Japanese students do the same. In America, only 16% of college students graduate with a degree in any science, math, or engineering field of any kind. The world average is 23%, that’s sad. 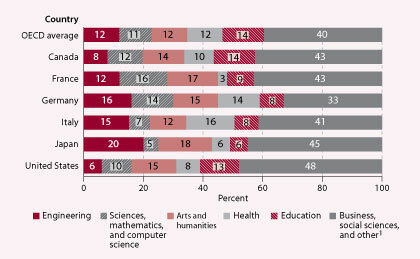 Ironically, Japan seems to have both the largest percentage of engineering majors and the largest percentage of arts majors at the same time. They must be taking the advice of both Gates and Jobs. At the end of the day, education in America boils down to our culture and what career young students choose for themselves. Teenagers have no idea what these jobs actually entail, so most of their career choices are based on society’s perception of the fields. Businessmen are powerful and strong, engineers are geeks. High school students are by default pressured into attending college and told to pick a major that’s “fun” for them since they’ll be doing it for the rest of their lives. We need to fix the perception of science and engineering education in America, and make students realize that difficult technical fields are “fun” too, and nothing beats changing the world for the better. For those of you not interested in changing the world, here is the salary information by job field. Money is usually what it all boils down to anyway.